This is a compatible replacement Universal Power UPG 12V-55AH R Solar Deep Cycle SLA Battery uses AGM technology. It can be used for both cycle and standby applications. The sealed, valve regulated design allows for superior performance in any orientation, even in harsh conditions, without any leaking or maintenance. 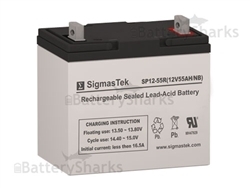 You will receive Brand New and Factory Fresh AGM SLA Battery with 1 Year Warranty. Buy now, at competitive price! The replacement Universal Power UPG 12V-55AH R Solar Deep Cycle SLA battery can be stored for up to 9 months at 25°C (77°F) and then a freshening charge is recommended. For higher temperatures the time interval will be shorter. If you need further assistance purchasing replacement Universal Power UPG 12V-55AH R Solar Deep Cycle SLA batteries, please contact our customer service department at (800) 657-1303 or e-mail us. Buy your replacement Universal Power UPG 12V-55AH R Solar Deep Cycle SLA battery with confidence today! Orders for in-stock items are typically shipped within 24 hours.